I believe there may be a glitch in the logic. I have come across a puzzle that cannot be solved. If one of the programmers would like a screenshot. Let me know where that can be sent. Please send to debug@genina.com or better yet post it here. You can do that by uploading the screenshot to any file sharing service and posting a link to it in your message. Hello. Thanks for emailing the screenshot. The puzzle is correct, but your solution up to the point seen in your screenshot is not. 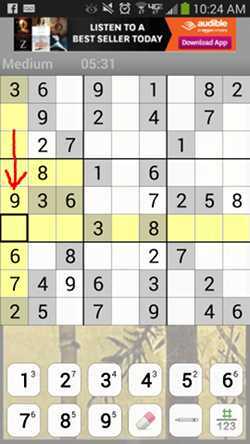 Specifically the cell with value 9 (indicated by the red arrow). Please explain the reasoning that led you to put it there. may want to pay closer attention to what you put in the cells, rather than just guessing. took me more time to copy the puzzle than it did to solve.